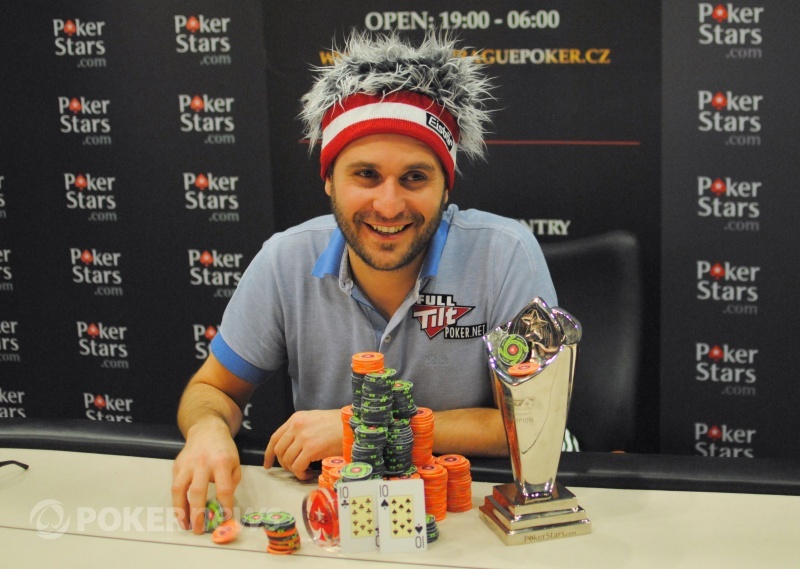 Roberto Romanello is the PokerStars.com EPT Prague Main Event Champion and a worthy one at that. Since Day 1b Romanello has been amongst the chipleaders and after defeating Emilliano Bono heads-up he now has the trophy, the title and €640,000 in his back pocket! He came into the final table fifth from eight in chips but he played perfectly all the way through and thoroughly deserved to win each and every single one of the 16,890,000 chips in play. Romanello has entertained his opponents and the media alike with his witty banter, his happy go lucky attitude and the fact that he is one of poker's true gentleman. Ask anybody in this industry to speak a bad word of him and you will not find a single soul who will do so. After being overcome with emotion and having to leave the tournament area, Romanello composed himself and returned to rapturous applause from the spectators, staff, media and railbirds who had all gathered round to welcome the new champion. After accepting the winner's trophy, Romanello asked if he could say a few words. After asking for a round of applause for the tournament dealers, who have been superb once again, Romanello had this to say to his supporters. "The support was superb all week. I feel like everyone wanted me to win and it feels so good to actually do it." This result is Romanello's biggest by a long shot, more than four times his previous largest cash, which stood at $200,000. However, you get the feeling from his reaction that the money, although extremely welcome, means less than being able to call himself EPT Prague Champion. From everyone here at PokerNews.com, congratulations to Roberto Romanello, the 2010 PokerStars.com EPT Prague Main Event Champion! Roberto Romanello opened for 575,000 from the button and in the big blind Emilliano Bono announced, "I reraise." He counted out 2.475 million and pushed it across the line. Romanello quietly announced all in. Bono announced call, and they were racing. 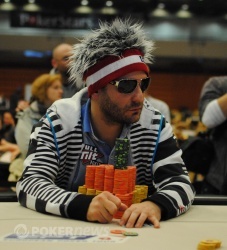 Romanello appeared to start hyperventilating when he flopped a full house, and was in tears by the river. He quickly ran off to compose himself, but when he returns there is going to be some serious partying, as we have ourselves a brand new EPT champion. Just as it looked like Roberto Romanello was going to completely run away with this tournament, Emilliano Bono just won a pot of more than one million chips. Romanello opened up the betting with a raise to 450,000 and Bono quickly called. The flop was met with a check by Bono, a bet of 625,000 from Romanello and a snap-call from Signore Bono. The made an appearance on the turn and both players checked. But when Bono quickly bet 500,000 on the river, Romanello folded. Emilliano Bono limped in on the button and Roberto Romanello checked his option. They saw a flop. Romanello check-called 230,000 from Bono and they saw a turn. Romanello check-called again, this time for 325,000. Romanello checked a third time and this time Bono checked behind. He flipped the for a pair, but mucked the other card when Romanello turned over for a pair of tens. Current standings - Romanello 11.5 million, Bono 5.5 million. 1) Button raise and take the pot. 2) Three-bet out of the big blind (1,180,000 over Bono's 370,000) and get a slow fold. 3) Button raise to 355k and take the pot. 5) Limp the button preflop, hit a pair of fives on a totally checked-down board of board and get flashed the when showing down . The vast majority of pots have been settled preflop but one just now actually went to the flop! 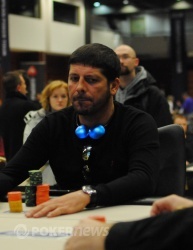 Roberto Romanello limped from the button and Emilliano Bono checked his big blind. The flop of saw Romanello bet 170,000 and Bono quickly fold. After several minutes of back and forth blind stealing, Roberto Romanello raised to 370,000 on the button and Emilliano Bono eyed him up and made the call. Both players checked the flop and they saw a turn which Bono liked enough to bet out 410,000. Romanello liked it too and called, and they proceeded to the river. The river came down the and this time Bono checked. Romanello bet out a chunky 1.135 million and after just the briefest of pauses Bono folded. Current standings - Romanello 10.2 million, Bono 6.7 million. In between the flopless pots (which are traded off fairly evenly) the first period of the heads up have gone mainly to Emilliano Bono. Bono raised on the button to 380k and Romanello called. They checked all the way down until the river spelled . Romanello checked a final time and Bono won the pot with a 450k bet. Next time he was on the button, Romanello called his preflop raise (370k) again, but got no further than a flop which Bono bet to the tune of 450k when it was checked to him. Finally, Roberto limped his button, and Bono checked. No bet on the flop, but the turn was more interesting: Bono checked, Romanello bet 175k and Bono raised to 420k. Romanello passed after the briefest of consideration.